The apartment is actually 2 apartments with a common entrance. One 2 bedroom apartment (65 m2) and a studio apartment (28 m2) with a sleeping area and a living room with a kitchenette. Both apartments have fully equipped bathrooms. The appartment is therefore perfect if you are several couples that do not want to live too close together, or you travel with youth that want some privacy themselves. It is like separate hotel rooms with a common spacious veranda (sleeping space for 8 persons - 6 beds + 2 sleeping couches). Private locked parking for one car is included on the ground floor. The apartment is on the second floor (with elevator). Pets and indoor smoking is not permitted. The apartment is just next to the wonderful beach in the center of Sainte-Maxime (Plage Centre Ville). The apartment is perfectly located to enjoy both beach life on a wonderful sandy beach and at the same time have immediate access to restaurants, activities, services, etc, in the center of Sainte-Maxime. 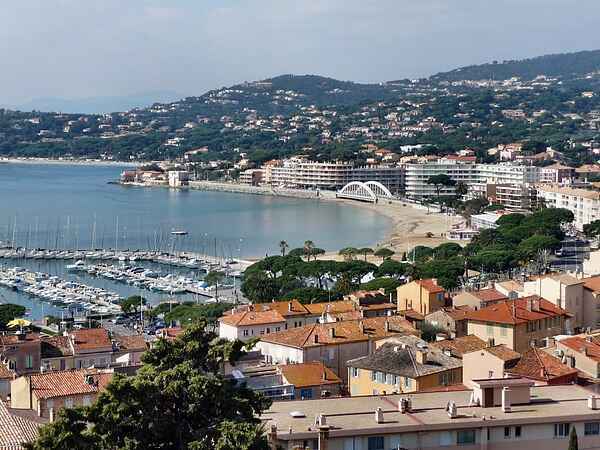 Sainte-Maxime is an active, lively city all year around and has a lot to offer children, youth and adults of all ages. There are lots of things you can do - bicycling, golf, tennis, shopping, watersports of all sorts, concerts, visit wineries, and much more. The city has lots of cafees, bars, restaurants, ranging from basic to Michelin standards, and there are lots of things going on especially during summertime. Nightlife is calmer than in Saint Tropez, its sister city on the other side of the bay, but if you wish to take part in the famous nightlife of Saint Tropez it is just a short 15 min boat trip across the bay. The shuttle boat runs around the clock during summertime. Sainte-Maxime has a great location if you want to experience the best of the French riviera. You can go to Cannes, Nice, Monaco, a short trip to Italy, or visit the Alps. We very much recommend Porquerolles, an island where you can rent a bike and go find a quiet lagune to swim, relax and enjoy. You can explore and take part in various outdoor activities in Gorge du Verdon (the French version of Grand Canyon), or enjoy a boat tour on the canals of Port Grimaud (a French "mini" Venice). If you are fond of beach life then the famous and absolutely beautiful Pampelonne beach outside Saint Tropez is a must.